This is one to finish off soon. Its hammered from 10mm (3/8")spring steel piece, took a lot oa effort to thin it to variable thickness of 5 to 7 millimeters. Its done by forging not any stock removal,the bevels are forged as well as the tang too. I did grind the bevels then after forging them offcourse. Its 40 millimeters high and 5 millimeters thick in front of handle and then it gets a bit higher (heavier) towards. At the highest point its 47 millimeters and 7 millimeters thick, for mass and chopping performance. I did a good long whittling edge in the front of blade and then at the chopping art,its a lot duller convez and the again in the tip its shaving sharp (yep,it shaves in reality). In the bacside of the tip theres sharp edged 45 degree grind to crack bones and joints. The rest of the spine is ground coarse to have a lot of edge to throw sparks from firesteels. I heat treated this bit special way by insulating averything except the actual bevel parts,so the spine is mild and flexible and the edges are hard. This can be yanked like its a spring and it wont bend and it will return to its straight shape,without damaging the edges at all. 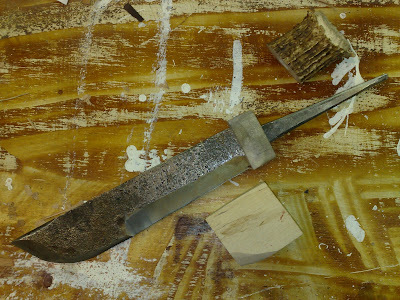 Tomorrow ill try to have time to make the handle ready,maybe even the sheath too,who knows. The handle has some deer bits in it as well as the "regular" curly birch. This is my one take on a more traditional leuku at the knife making course where i teach. I tried to keep it traditional but i wanted to put that whittling power in it,and i did a bit of crude filework in the spine,and the sheath will most likely have a built in place for 3/8" firesteel and a small diamond sharpening rod. Im doing it as it should be, meaning its made to be used,nothings going to be over-fined nor polished,as it wouldnt serve the purpose. Not that theres anything against shiney stuff but ive noticed that the more crude they are,the more they are carried and used. Looks like it's going to be one fine leuku when you're done. Love it already. It's unfortunate that lots of folks don't realize the great usefulness and versatility of medium-sized camp knives. Many in the bushcraft crowd only stick to axes and "bushcraft knives".